According to William H. Land, the most important thing about power is making sure you don’t have to use it. But when there is so much of it on offer, can you really resist? We spent a week with the Mercedes-AMG A45 to test our resolve. Question. What’s bright red, has 376hp and does 0-62mph in 4.2 seconds? If your answer was a Ferrari F355, you’d be wrong, as the Maranello machine actually takes 4.7 seconds to hit 62mph. Yes, welcome to 2016, where you can buy a family hatchback with greater performance than a 1990s mid-engined supercar. But one with the benefits of better fuel economy, lower emissions, and far greater practicality – such is the pace of development in the past two decades. The A45 is the apex predator in the evolutionary process, as the most well-endowed mega hatch on sale at present. That adds a big chunk of gravitas, and expectation, that the A45 needs to live up to. For Mercedes this needs to be the gateway drug to AMG ownership – it’s selling a lifestyle choice just as much as it’s selling a car here. 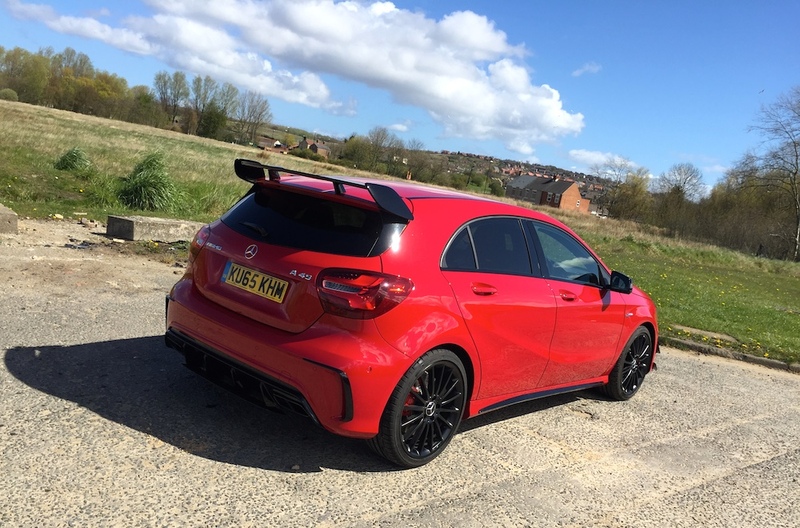 The first part of that sales pitch is making it look distinctive and, despite the number of AMG-kitted lesser A-Class models on the road, the A45 manages to look genuinely tough. 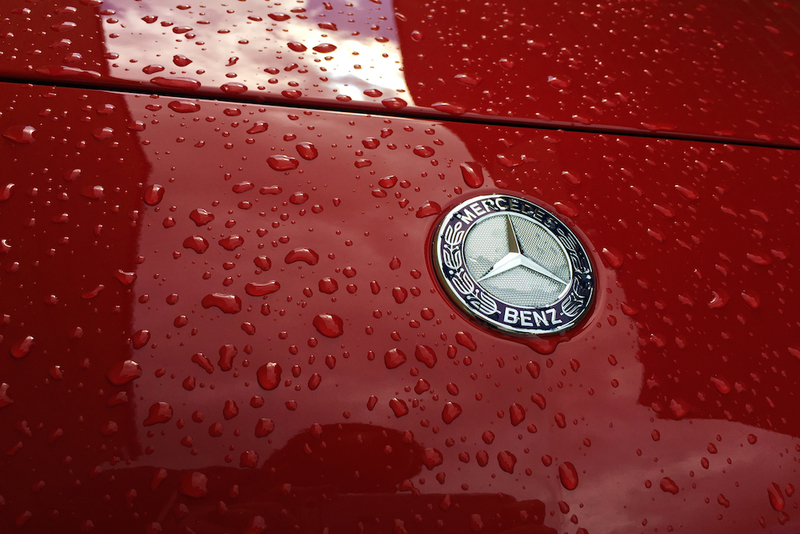 In Jupiter Red, adorned with the optional AMG Aerodynamic Package, our test car was anything but subtle. It also had the aural bark to match the visual bite, courtesy of the performance exhaust system. It’s loud – properly loud – and perhaps not an option to pick if you’re slightly more self-conscious. 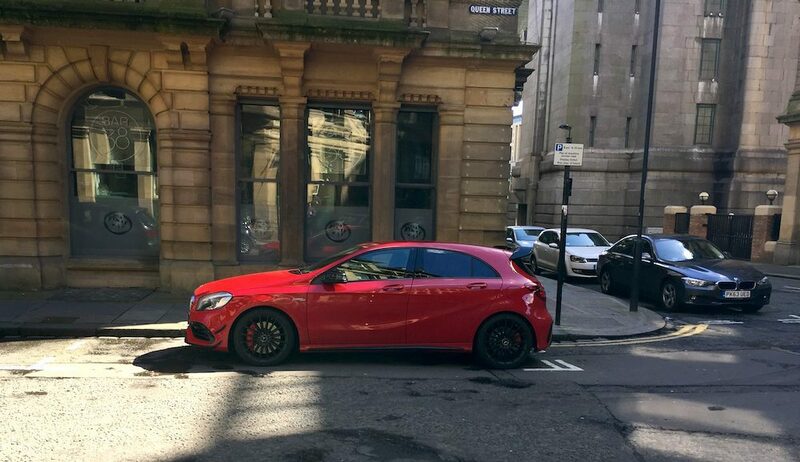 Clearly you don’t have to spec your A45 this way. Choose a subtle colour, ignore the exhaust and aero kit, and it could make for a relatively stealthy way to travel fast. But, being ESM, we’re all for dramatic entrances and the specification of this test car is very close to what we would pick ourselves. On the road, and especially on the motorway, you do have to be prepared for the fact seemingly everyone will want to race you. Be it a diesel Audi A4 estate, or Honda Civic Type-R, there’ll be no shortage of drivers trying to bait the AMG hatch. But we didn’t bite, as there’s something wonderfully cathartic from the knowledge that you could leave 90% of other road users in your wake. The A45 has nothing to prove, and that translates into the way in which you drive it. Such power is on offer when you want it on your terms and nobody else’s. You may find yourself dictating those terms to yourself quite frequently, however. This car is absurdly fast, and you’ll find that you need several acceleration runs to try to process just what happens when you give it full throttle. Such is the tractability of the 2.0-litre turbo engine that most times only 25-50% of throttle pedal travel is needed to make good progress. But give it the complete 100% and, after a slight pause for turbo lag, the A45 pulls like all the best motoring clichés going. Like any good AMG car, the motor is very much the star of the show. Also, just like a V8 or V12 engine from Affalterbach, each one is hand-built by an individual master engineer. Stefan, who built the one in our test car, is clearly a talented guy for wrestling all 376 horses into that 2.0-litre block. 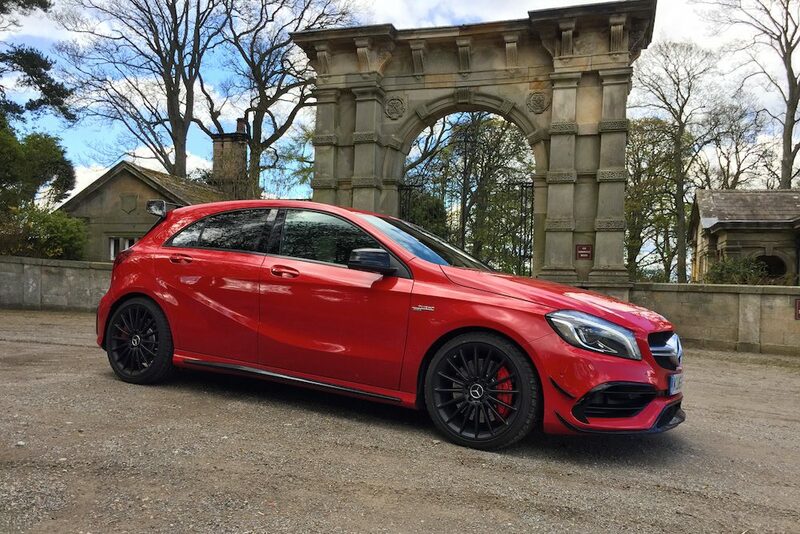 The resulting output is an unrelenting, ferociously rabid, stream of acceleration that allows the A45 to cover distance cross-country with ease. Gear selector along with AMG drive mode dial. Note embossed AMG crest. Aiding this is a seven-speed, dual-clutch, automatic gearbox that – unlike many – will do exactly what you tell it to. Want to run all the way to the limiter? No problem – stick it in manual mode and it won’t shift up at the red line. Want to drop two cogs instantly? Double tap the paddle and it’s done. Most paddle shift gearboxes lose their novelty within minutes but the ‘AMG Speedshift’ has real staying power. You’ll be treated to pops and crackles on the upshift, with glorious blips of the throttle on downshifts. With the sports exhaust added the A45 genuinely becomes a musical instrument – we were staggered a four-cylinder turbo engine could sound this good. With Sport, or Sport+, mode engaged the A45 is a raucous machine. But dial things back to the ‘Comfort’ option and it becomes a relatively relaxed cruiser. We covered many motorway miles with Comfort mode selected and the cruise control on, arriving completely unflustered. Despite the immense performance on offer, the A45 still has the ability to do normal family hatchback things well. Although our car lacked the optional Selective Damping suspension and rode on bigger 19” wheels, the ride managed to be firm but unobtrusive. Yes, it picked up imperfections in the road, and could hardly be described as pillow-like, but for a hot hatch it rode comfortably enough. 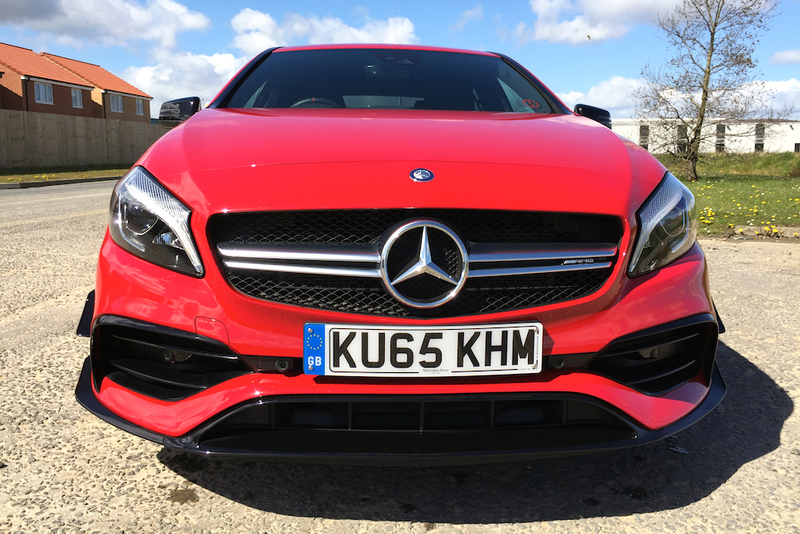 Pleasingly, the ride improves with speed – something that obviously isn’t hard to achieve in the baby AMG. The A45’s steering is weighty and accurate, although there’s not a great deal in the way of feel. But it responds quickly enough to allow for precise cornering, letting you carry speed with confidence. That feeling of self-assurance is backed by an AWD system that manages to rein in all the torque with ease, and tyres with no apparent lack of grip. It makes for a convincing package, but one that will undoubtedly by dominated the by that thumping engine. Despite the huge amounts of power and torque on offer, the A45 still managed respectable fuel economy figures. Motorway cruising returned an average of 31mpg, whilst making ‘progress’ dropped this to 25 or less. That might not sound amazing, but in the context of the performance available, this is close to having your cake and eating it: guilt free. Your conscience can also be clear about the interior trim, if you stick with standard specification that wraps lots of surfaces in grippy Dinimica suede. It’s basically Alcantara, but made from recycled materials, and covers the seat centres and sections of the AMG GT-sourced steering wheel. Inside of the A45 is dark, with a narrow glasshouse and black headlining making things feel rather cave-like. Albeit a cave that features red stitching, red trim around the air vents, and red seat belts. The latter being our personal favourite. It does feel special enough to justify the price tag, with a definite motorsport theme running throughout. …decent room up front though. Our only gripe with the interior, and one shared with other A-Class models, is that the climate control dials are mounted very low in the dashboard making them hard to adjust without taking your eyes off the road. Oh, and that the standard sound system packs so much bass we actually had to turn it down, although that is perhaps less complaint and more compliment. In fact there was very little to pick fault with the A45 in the seven days we spent with it. ESM rarely pines for much, but we truly missed it when taken away – a rather good indicator as to how much we fell for its charms. The shadow of the list price, and the ability of rivals like the Volkswagen Golf R or Ford Focus RS hang in the air, but the A45 did enough to convince us of its position at the top of the food chain. So here’s the deal. The Mercedes-AMG A45 is a truly epic car. Performance is never less than gut-punchingly fast, whilst grip and traction mean you can feel supremely confident when pushing on. Such is the breadth of A45’s ability that it can go from family hatchback, to quasi race car, and back again as the mood takes you. It feels like a bespoke AMG product, not just an enhanced A-Class, which goes a long way to justifying the formidable price tag. Many won’t be able to see past the concept of a £40,000 hatchback, especially when rivals can do a generally similar role for £10,000 less. However, choosing the A45 will perpetually reward the few who are more concerned with entry into AMG ownership, rather than just simply having a very fast five-door.